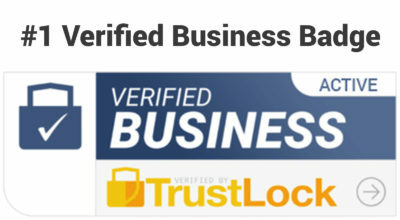 Build your trust, authority, credibility, and sales with TrustLock Business Verification Badges today! Our #1 best selling trust badge helps visitors know that your business is legitimate and real. The Verified Business badge by TrustLock is one of the best way to build credibility and trust. The TrustLock Verified Business badge helps your customers know that you are who you say you are. It removes their hesitations on your address, location and other information about your business. The Verified Business Badge is the #1 way for you to prove business legitimacy via a third-party. You simply send us sufficient proof of your business existence and personal identity and we grant you the approval — It's as simple as that! We’ve extensively tested our badges with various text options, and after careful internal research, we realized that the simple words “Verified Business” was the best phrasing possible for business verification. Our badge phrasing is easily recognizable and proven to build trust vs. other brands and alternatives. Other business trust badge brands tend to over-size their own brand logo while minimizing the actual verification title or type. In our research, this negatively affected sales, as not all brands are recognizable by everyone. We realized that customers understand phrasing like ‘verified business’. When these words are backed by TrustLock, it’s just another confidence boost for your visitors when they land on your site and wonder if your business is real! Just because you pay more, doesn’t mean you actually get more. In fact, our badges not only provide more features and better options. We’re also priced cheaper than all other trust badge competitors offering similar business badges. Why spend up to 95% more when you can try our badges risk-free? Each time someone loads one of your pages, our system uses conditional logic to ensure that your domain URL is the actual one trying to load the URL. This protects your business identity in regards to TrustLock and prevents your badge from being stolen by competing companies. OUr badge simply won’t load unless it matches your exact registered URL. When someone clicks on your badge, you’ll have the option of linking this page directly to your own individual TrustLock business verification page. Each approved TrustLock subscriber has an individual verification page(s) that also verify your legitimacy. These pages are publicly available and help you promote transparency so people know that you say you are is really you. As an added bonus all Verified Business TrustLock members receive backlinks from your Business Verification page on our site! When your visitors hover over any badge with their curser on your site when using Java implementation, they’ll see an expanded understanding of your business verification criteria. Furthermore giving greater context to your business verification. If you opt for the iFrame implementation option, a separate hover effect is employed that doesn’t expand outside the frame itself. These various hover effects are optional and available to all TrustLock Verified Business subscribers. We strive to give our Verified Business subscribers the best value possible by providing more badge designs and options than any other trust badge company offering verifications on the market today. Our other badge designs use the same similar phraseology and concepts used in the success of our original badge. Our badge options give you the flexibility of choosing a badge that fits perfectly with your specific landing page or website! Our badges are configured to work on any platform. Whether your site is built on WordPress, Shopify, Squarespace, BigCommerce, Click Funnels or another platform, our badges should configure perfectly! If your site doesn’t support Java badges we have iFrame badges and even image-only badges to suit any platform, website or landing page. When you buy the Verified Business badge, you won't have to worry about dealing with another site for people to review you on. Instead, our badge does not contain reviews. Your site can only be approved or not approved. It's simple and much easier to manage than other business verifications that require you to keep your site up to a minimum rating or you lose your verification. The only way you can lose your verification with TrustLock is if you don't follow our TOUs, or get a significant unresolved report from your verification page. We always work to keep our badges on sites that treat customers well and often do random checks to ensure abuse is not occurring with our badge appearing. If you have further questions or concerns, please contact us! Our Java and iFrame badge implementations are designed to load last - this way your content is not delayed. Your page should not encounter any detrimental load times after you add our badges. Your page should load at the same speed it always has, just with a TrustLock badge as an added bonus. Are you ready to get the #1 Verified Business Badge on your website? Our business verification takes under 24-hours after you submit your proof of business. If for any reason we can't verify you, we'll seek to resolve the issue or give you a full 100% refund. If you have any questions, shoot us a message. Get TrustLock on your site today!